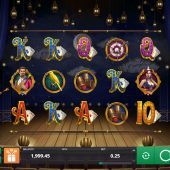 The Great Albini slot is possibly the best game I've seen from minor developers which are presented through Microgaming's Quickfire platform. In this case Foxium have produced a game of far better quality than the rest, for example Snow and Sable, Fortunium and the dreadful Romanov Riches. Here we have a magic theme as you may have guessed, with Albini being a magician and so gentle music of mystery awaits us with some nice looking symbols on transparent reels over a classical auditorium stage. Albini stands to the left of the grand stage ready to enchant our game, so what can he pull out the hat to add to our bankroll? The Great Albini gives us 25 lines over a standard 5x3 grid with symbols single, although they can appear twice on a reel, separated. The pays may give an indication of the decent potential and volatility here with Albini paying 40x bet for 5-of-a-kind, Lily the assistant 20x, Canary 12X, Knives 8X and Lucky Cups 4x with five card values at between 3 and 2x for a full line. There is a single Wild on reels 2 to 5 but before we get to the main bonus, Albini has a couple of tricks up his sleeve. As with games like Blueprint's Ted and King Kong Cash, the character to the left can add things to the grid. Just like those two, Albini could be bluffing when he waves his wand and nothing will happen. If it does then we can expect to see a stack of green Mystery Boxes fill reel 3 or a giant scatter. The Boxes will remain on reel 3 and then you'll see a series of 3 respins with only single Boxes or game logos on the reels. Any box appearing also sticks in place and this resets the respins to 3 again. Once this ends all the boxes will reveal a symbol aside from the scatter or Wild and you could get a big win in some cases. Albini may also throw a giant 3x3 scatter on the centre 3 reels which you'll see spinning round but it has to stop fully in view for the free games trigger to occur. 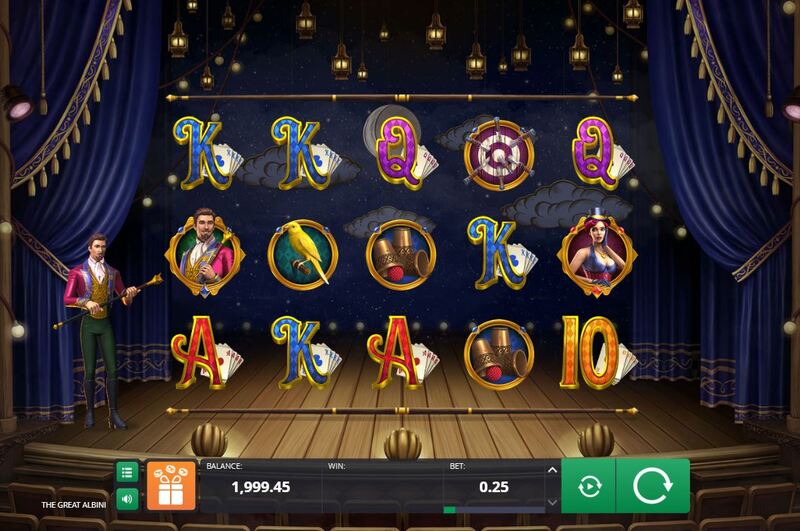 You can actually press the Bonus Box symbol on the game menu bar to buy the free games here - 100x bet buys 8 spins, 125x buys 10 and 150x bet buys you 12 which you'd get with a normal trigger. These are expensive because the free spins can produce some very high pays, up to 4000x bet Foxium tell us proudly in their intro screen! Assuming you are sensible and wait for a natural trigger with the block scatter, you'll get 12 free games. Lily's feature can occur in these but before we get to that you need to know that the reels expand to 6 rows each, all symbols become stacked up to 6-high and you double your paying lines to 50. If Albini summons Lily on any spin, she will become a 2x Wild reel on either reel 2, 3 or 4 and award respins with this reel sticky until Albini tells her to disappear again. These won't come off of your remaining spins total and you can see it remain for 10 or more respins, mounting those wins up.